OOingle - Amazon Prime Perks!! Well today we officially have 24 shopping days left till Christmas, as the days count down you are going to want your shipping time frame to be the smallest as possible. 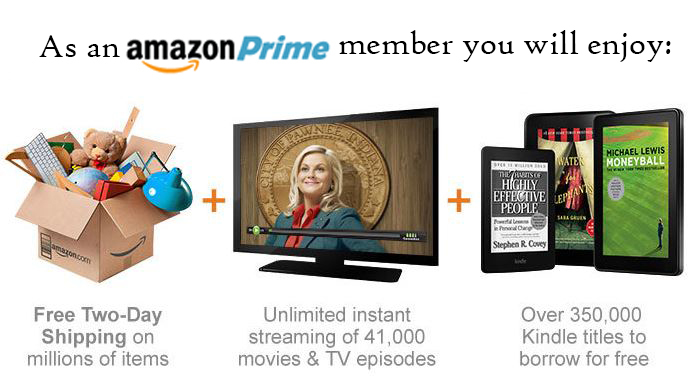 If you have never given Amazon Prime a try right now is the PERFECT OPPORTUNITY! You can try it FREE for 30 days, while you are enjoying it you will get FREE 2 day shipping on any products shipped by Amazon, these will be specifically marked for you so you know you will get it fast. You also get to enjoy 41,000 Instant Streaming Movies & TV Shows. And 350,000 Kindle Titles you may borrow for FREE if you a Kindle Owner. My favorite though above all is the FREE 2 day shipping. I will not get rid of my Amazon Prime account for that awesome option right there. At the end on your 30 days if you do not feel you will get the full value out of the Annual Subscription feel free to cancel. But I can tell you this much if you order even 2 items a month you have basically made your money back with the Free 2 Day Shipping. Awesome Amazon Easter Promo ~ Earn Amazon Credit! !